Welcome to Faliraki Rhodes. 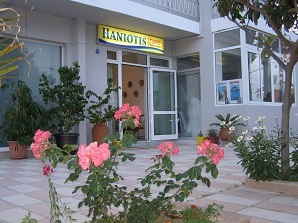 Just 200 meters from the famous sandy beach and in the center of Faliraki are situated Haniotis Studios. The building complex consists of 17 studios which accommodate up to 4 persons. We are conveniently located close to restaurants, shops, cafeterias, super markets, bus stops to Rhodes and Lindos and taxi stations. Also we are a member of the Rhodes Association of Family-Run Studios and Apartments. Our complex is licenced by the Greek National Tourism Organisation EOT. Rhodes Town and the Central Harbour are 14 Kilometers from Faliraki and Lindos 35 Kilometers. Rhodes airport is 15 kilometers away and there is a taxi service available. The Family hospitality completes the warm and friendly atmosphere.